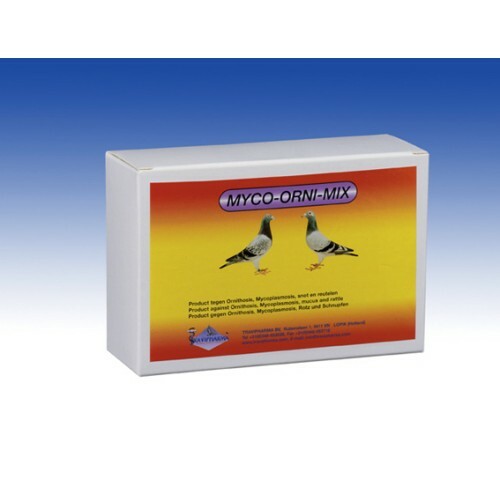 Myco-Orni-Mix - 5 sachets - by Travipharma is a product for the treatment and prevention of Ornithosis, mycoplasmosis, mucus, rattle and severe respiratory problems. Supplemented with various vitamins, such as B1, B2, B6, B12 and K3. For oral administration through drinking water. * Dosage: 10 grams per 2 liters of water or 1 kg of food. - Preventive: 3 days. Repeat every 3 weeks. - Curative: 6 days. In severe cases of 10-14 days. *- The absorption of water from other sources during treatment should be avoided. Replace drinking water daily. In severe conditions, it is recommended to renew the duration of treatment with another five days.